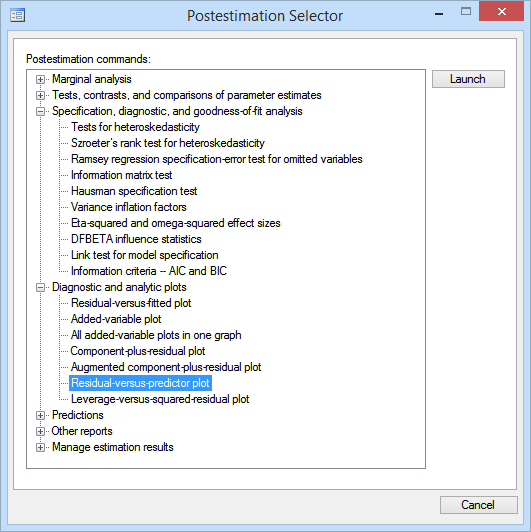 The Postestimation Selector was introduced in Stata 14. See the latest version of the Postestimation Selector. As you fit models, Stata's new Postestimation Selector shows you postestimation statistics, tests, and predictions that you could use right now. Suppose we have just fit a linear regression of systolic blood pressure on age, weight, and an indicator for females. What's next? How can we check to see whether any assumptions of the model have been violated? Can we compare the model we just fit to the more complex model we may have fit previously? Can we save our estimation results so that we can use them again later? How do we know which of Stata's hundreds, if not thousands, of postestimation features are available after the model we just fit? 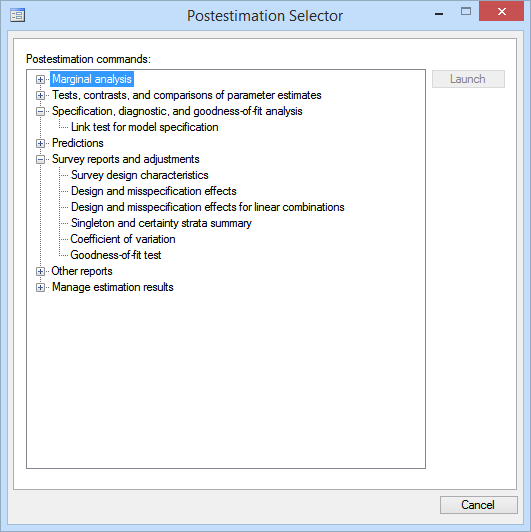 The Postestimation Selector provides a list of all postestimation tools available after fitting our model and provides two-click access to the corresponding dialog boxes. We have selected Residual-versus-predictor plot. We click on Launch, the dialog box opens, and we create our graph. The Postestimation Selector will remain open so that we can perform the rest of our analysis. For instance, we can select Tests for heteroskedasticity and open the dialog box to perform a Breusch–Pagan test. We recommend that you leave the Postestimation Selector open at all times. Next, we decide to fit a logistic regression model for highbp, a variable that is one when the subject's blood pressure is clinically high and is zero otherwise. As soon as our new model is estimated, the Postestimation Selector updates and shows us the postestimation tools that are now available. While we could have found a list of available postestimation commands from the help file for logistic postestimation, the Postestimation Selector is more specialized. It lists only postestimation features available for the exact model that was fit, adjusting for any options or prefixes that were specified. Notice what happens when we take into account the complex survey nature of this dataset by specifying the svy prefix with our command. We find that some of the diagnostics and goodness-of-fit statistics that were available previously are no longer listed and that there is a new list of postestimation features that are available only when fitting models to complex survey data. We can use the Postestimation Selector to guide us to the postestimation tools that are available after any model that we fit, and with any combinations of options or prefixes. For more information, see the manual entry on the Postestimation Selector. Also read the overview from the Stata News.